British No. 1 Heather Watson in her 2012 Olympics first round match. After becoming the first British woman for a decade to reach the third round of the Wimbledon Championshps, on Monday British No. 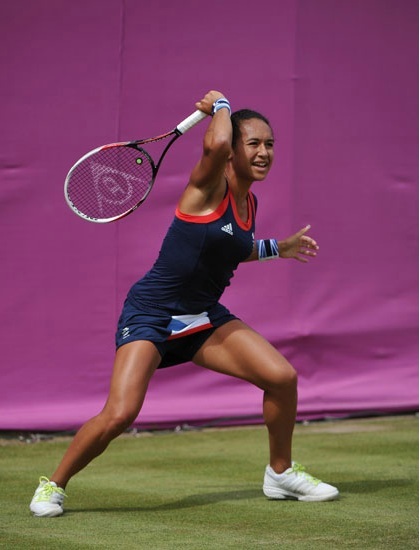 1 Heather Watson continued her confidence and form at the 2012 Olympics with an impressive straight-sets first round win over Spaniard Silvia Espinosa-Soler, 6-2, 6-2. "I'm very pleased with that win, I knew it wasn't going to be easy," said Watson. "I've never played her before but I knew she is a great player and wasn't going to give me any free points. I played well today." Of her upcoming meeting with Wimbledon quarter-finalist Maria Kirilenko of Russia, Watson stated, "She's been a top player for a long time. "I know she hits the ball hard. Typical Russian girl, tries to overpower and blast the ball. So I'm just going to play my game."